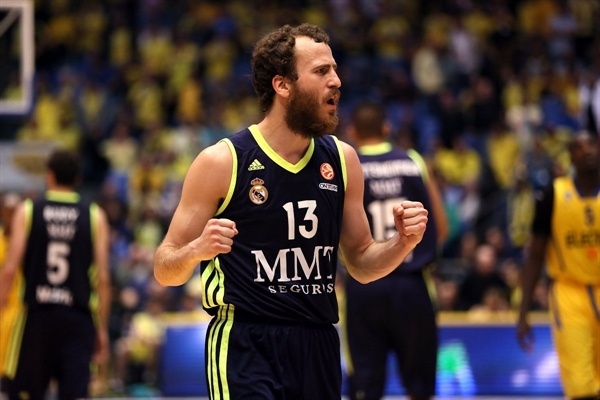 Real Madrid sweeps Maccabi, is first team to reach the Final Four! Real Madrid has made it to the Turkish Airlines Euroleague Final Four! Madrid reached the Final Four for the second time in three years by sweeping its best-of-five playoffs series against Maccabi Electra Tel Aviv. On Tuesday, Madrid downed Maccabi 57-69 in front of a sellout crowd of 11,060 fans at Nokia Arena in Tel Aviv, Israel in Game 3 of the series, which Madrid swept to seal its ticket to the Final Four in London, United Kingdom. Jaycee Carroll led the winners with 16 points on his 30th birthday. Sergio Llull added 13 while Sergio Rodriguez had 12 for Madrid. 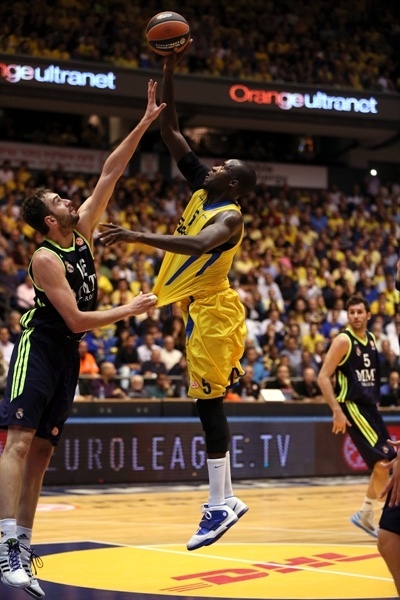 Shawn James led Maccabi with 18 points. Yogev Ohayon, Ricky Hickman and David Logan each added 11 for the hosts. In a pre-game ceremony, Maccabi president Shimon Mizrahi presented Devin Smith his bwin MVP for March trophy. Nikola Mirotic and Llull shined early to give Madrid a 5-14 lead. Maccabi bounced back off a timeout but a buzzer-beating basket by Carroll gave the hosts a 10-16 edge after 10 minutes. Maccabi rallied and a jumper by Ohayon tied it at 30-30, but a triple by Rodriguez put Madrid back ahead, 30-33, at the break. 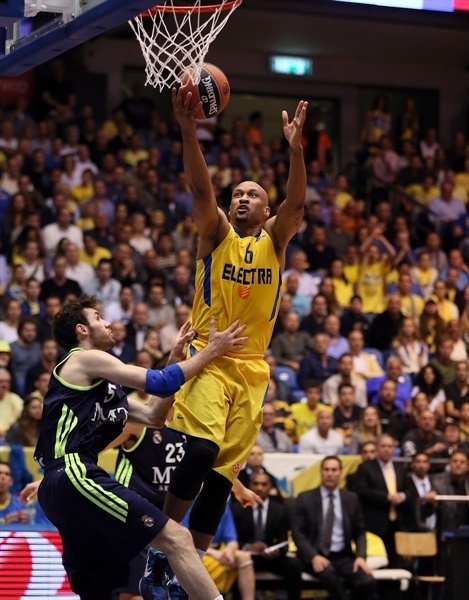 Maccabi shined after the break and a fast break layup by Logan gave the hosts a 42-38 lead. It didn't last long, as Carroll-led 0-10 run put Madrid ahead for good, 42-48. Madrid extended its margin to 44-52 after 30 minutes and then again to 48-61 soon after that, enough for the Whites to keep full control of the game and seal its ticket to the Final Four! Mirza Begic got Madrid going with a big basket off a spin move, as the guests held Maccabi scoreless in the opening 3 minutes. The hosts missed its 5 opening shots and picked up a turnover until Logan stepped up with a fast break basket. 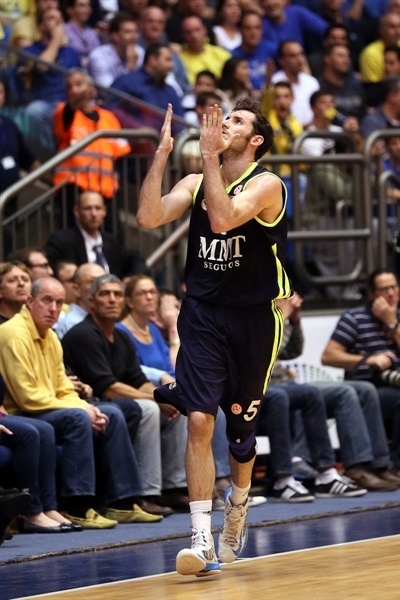 Madrid could not get Rudy Fernandez involved and kept missing open three-point shots. 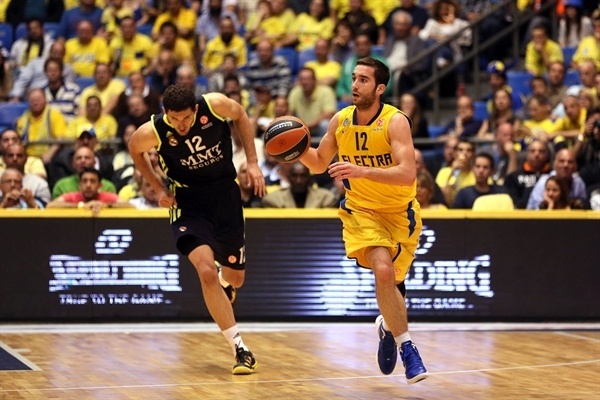 Llull rescued the guests with a bomb from downtown and a free throw by Logan kept Maccabi within 3-5. Mirotic buried a corner three-pointer off a timeout, James scored down low and a two-handed dunk by Begic gave Madrid a 5-10 margin. Mirotic split foul shots, as Madrid brought Carroll off the bench to add a new scoring threat. Llull buried his second three-pointer to make Maccabi call timeout at 5-14. Maccabi kept struggling to score until James took over with a layup-plus-foul and a driving basket by Hickman kept the hosts within 10-14. A buzzer-beating put-back layup by Carroll restored a 10-16 Madrid lead after 10 minutes. Hickman nailed a four-meter jumper early in the second quarter but Rodriguez buried a long two-pointers at the other end. James split free throws that a red-hot Rodriguez bettered with a wild driving basket, good for a 13-20 Madrid lead. James dunked, Carroll fired in an off-balance shot and a second-chance basket by Smith got the crowd involved at 17-22. 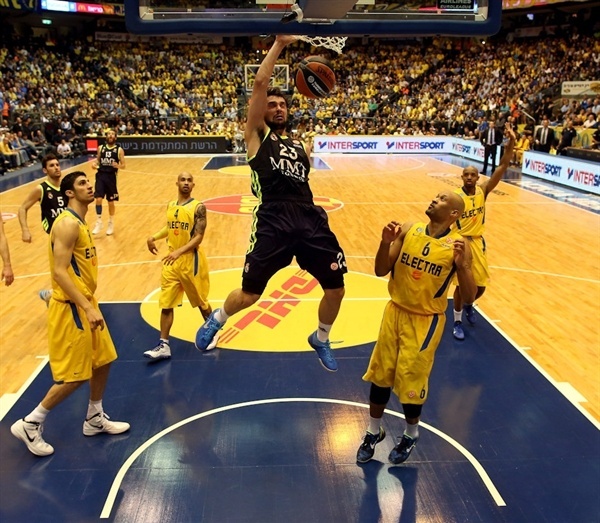 Logan fired in a seven-meter bomb but a mid-range jumper by Llull briefly silenced the crowd at 20-24. 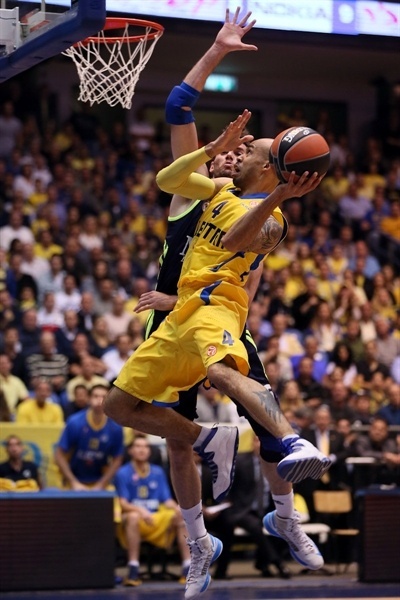 Felipe Reyes and James scored down low and a three-pointer by Hickman brought Maccabi as close as 25-26. Reyes made free throws and soon added a put-back basket to give Madrid some fresh air at 25-30. Hickman hit a triple which hit the rim, went up and fell down and a jumper by Ohayon tied it at 30-30. Rodriguez took over with a wild three-pointer off the dribble to put Madrid back ahead, 30-33, at halftime. Llull struck from downtown immediately after the break but Logan joined the three-point shootout to keep Maccabi within 33-36. 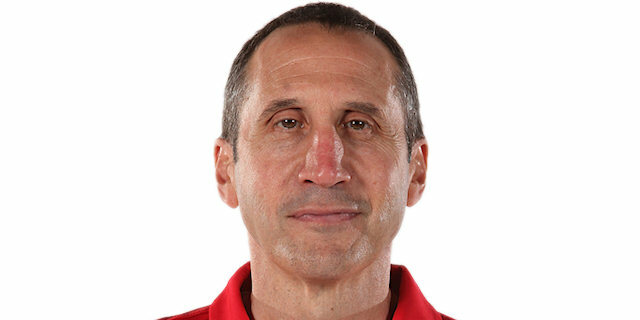 James shined with a backdoor layup that Begic erased with free throws. A three-point play by Ohayon soon tied it at 38-38. 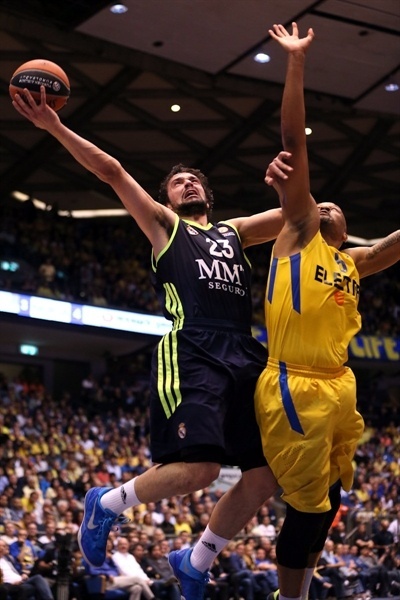 Madrid kept struggling to score, as Maccabi, pushed by an outstanding crowd, was all over the place on defense. Meanwhile, a wild driving layup by Ohayon gave Maccabi its first lead, 40-38. Logan took over with a fastbreak layup which forced Madrid to call a timeout at 42-38. Carroll nailed a catch-and-shoot triple and free throws by Llull put Madrid back ahead, 42-43. Fernandez struck from downtown - his first points - and a fast break layup by Carroll forced Maccabi to call timeout at 42-48, after a 0-10 run. James rescued Maccabi with a power layup but Carroll followed free throws with a wild slam off a steal to boost Madrid's lead to 44-52 after 30 minutes. Fourth quarter: Madrid seals it early, reaches the Final Four! 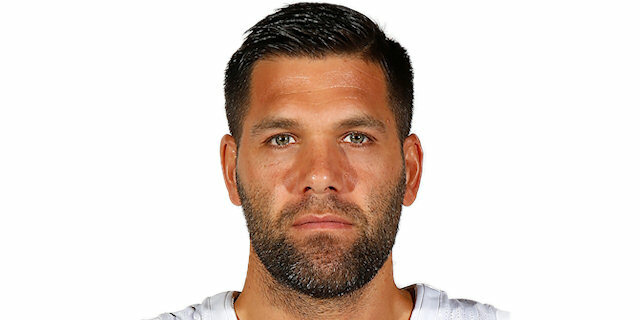 Guy Pnini shined with a driving basket off a spin move early in the fourth quarter that Fernandez bettered with a wild three-pointer off the dribble. James made free throws but Mirotic nailed his trademark corner triple to give Madrid its first double-digit lead, 48-58. Maccabi struggled to score right when it mattered most and Fernandez struck again from downtown to force coach David Blatt to stop the game at 48-61. Ohayon buried a jumper but he didn't find much help around. Meanwhile, a three-pointer by Rodriguez sealed the outcome, 50-64, midway through the fourth quarter. 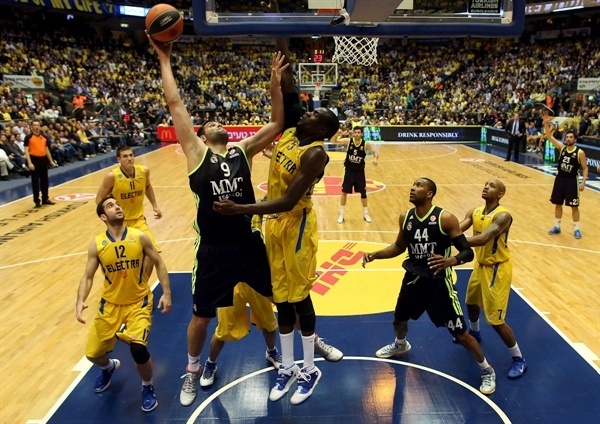 Maccabi did not give up, however, but Madrid had started to run the game clock down. Carroll finished a long possession with a three-pointer and a driving layup by Rodriguez boosted his team's lead to 53-69 with over 3 minutes left. Ohayon scored again but everything was said and done, as Madrid was celebrating that the Whites will keep fighting for Euroleague glory at the O2 in London! "We played well on defense but our offense wasn't good enough. We scored just 57 points and that's not going to be enough against a great team as Real Madrid. They won fairly. They are a better team. We aren't Final Four material this season. We made a great run to make it here. We will try to come back next season stronger. It hurts. We didn't want to finish the season in front of our fans but gave everything we had." "The series featured 120 minutes of great European basketball. Maccabi has a great team. They fought until the last minute. I appreciate the way they played. We were solid in the first half, enough to take a three-point lead at the break. We did a good job on rebounds and defense. They attacked us in the second half but we fought back, made some good plays and won the game. I didn't feel like my team was the favorite. My team gained a lot of respect. We grew a lot as a team from last season." "We are really disappointed. We are a better team than this. Madrid was better than us. It will take us some days to recover from this but we will do it to finish the season well. We couldn't play on offense as we wanted. It was really a tough series"
"It was a very difficult series. Maccabi is a tough team. They didn't let us rest at any time, especially here. The game was very close in the opening three quarters. It is very difficult to play in this arena. Fans gave Maccabi a great push but we stayed focus and won. We are now going to the Final Four. This is an amazing feeling for all of us. 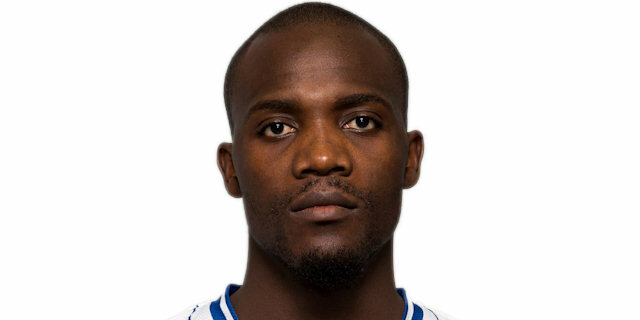 I hope we will win this time, no matter who will play against."